Page X4 under "Courses and Careers"
Fashion collides with technology in a classroom on the third floor of OCAD University. Students in professor Kate Hartman’s advanced wearable technology class are gathered around a big table in the middle of the room, discussing their “social bodies” projects. The assignment: incorporate technology into a product or garment in a way that will bring about a social interaction. The conversation is fluid, shifting in a moment from fashion and pop culture trends to which fabrics and materials are most conducive to circuitry and programming. Further confusing the discussion is the tug-of-war between the artistic and the commercial. Erin Lewis, an integrated media student, is talking about her project, which she has called “stock market lingerie.” It’s a brassiere that she has wired to give stock market updates as the clasps are undone. People keep asking where she would like to sell it, Lewis tells the class, and that puzzles her. “It’s an art piece. It’s not something you’re going to find on the shelves at Wal-Mart,” she says, and the class responds with howls of laughter. Industrial design student Ken Leung is talking about a project he’s called “The Soundtrack of Their Life.” It’s two pendants, each equipped with galvanic skin response sensors to measure the changing moods of the two people wearing them. Each pendant sends a stream of data, which is transformed into music when it reaches the other person’s pendant – low steady tones when the first person is calm, and high-pitched notes when the person is intensely happy, excited or anxious. Leung concedes that it may not be an entirely accurate way to measure moods, but the point is to foster understanding between the two users. The idea lights a spark in class. Students respond with questions and suggestions: Where is the best place to put the sensors? Who would use this technology; couples or mothers and babies? Wearable technology is the science and art of incorporating technology into clothing and wearable products. It explores the relationship between the human body, information, fashion and the gadgets that we love. Although still in its early days, this field is being pulled into the future as technology becomes more mobile, discreet and powerful. Today, most applications are found in health care, athletics, and the military. At OCAD, students in the introductory class learn the nuts and bolts of technology – from how to work with micro-controllers, sensors and other devices to programming and how to incorporate devices into clothing using conductive fabrics and materials. At the advanced level, students develop, experiment with, and produce their own projects. Undergraduate students at OCAD can get a minor in wearable technology. Students come from industrial design, studio arts and other disciplines, Hartman says. Readings in the course range from technical how-to guides that cover the latest technology and programming to industry journals and pop-culture perspectives on technology and fashion. Students are evaluated on how well they develop and articulate their own ideas, as well as the design and technical success of their projects. The Bluetooth Mate Gold and Bluetooth Mate Silver are handy wireless modules that can plug directly into your Lilypad Arduino or Arduino Mini Pro. While they are rather pricey, they save you the trouble of configuring the radio, wiring up extra components, and they can connect to any other device that is bluetooth enabled such as a laptop or smart phone. For most applications the Silver will do just fine (it’s range is 330′) and it is significantly cheaper than the Gold. //replace the 8 in the next line with your serial port number from the list above. For getting started with Processing, there’s actually a great book called “Getting Started with Processing”, which is available at Creatron and on Amazon. The examples from it are included in the Example menu in the Processing program. Finally, the most important thing to remember when adapting a piece of code to work with these modules is CHECK YOUR BAUD RATE. It must be set to 115200 unless you want to reconfigure the radio. This must be changed in both your Arduino and Processing code. If anyone is using Bluetooth for their final projectable, our fearless leader Kate said she would be overjoyed to have a lab session outside of class time to show us the [wireless] ropes. Please comment when you’d be free next week to get together. Tuesday before class or any time on Thursday before 6:30pm works for me. hey gang, I’d like to place an order for some neoprene and some velostat (two different companies). Anyone interested in placing an order together? lemme knows. 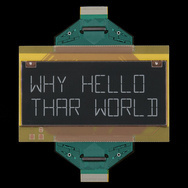 Sparkfun has started carrying an E-Paper display, similar to what you might see in a Kindle or other e-readers. Hopefully it will make its way to Toronto soon! Open call: Undergraduate and Graduate student artists working in and responding to forms of media. XPACE/IMAGES festival is seeking proposals from student artists working in and with media art. The term “media art” is deliberately broad and elusive, lacking commitment, but suggesting an alliance with technology, communication, time-based, or new media. Proposals should consider the space the artwork occupies (at a physical, psychic and phenomenal level), the historical referents (in the short but rich history of media artworks) and the ability to disrupt or repair the audience’s relationship to the artwork. Proposals are encouraged to be innovative and critical. This Monday! 7pm! Hacklab TO is doing an arduino workshop! This is the website! http://hacklab.to/ ! Exclamation!! !